Peanut allergy is a major public health concern, especially for children. ARS researchers have developed methods to produce peanut and cashew extracts with less allergens for use in immunotherapy. Photo by Jack Dykinga. Peanut allergy is a major public health concern, especially for children. “This is the most common cause of anaphylaxis in children and has become more prevalent in recent years,” says recently retired Agricultural Research Service (ARS) food technologist Si-Yin Chung. Anaphylaxis is a potentially life-threatening allergic reaction that has a quick onset. Allergy shots or other forms of immunotherapies are used as treatment, but may have limitations due to safety issues and side effects. 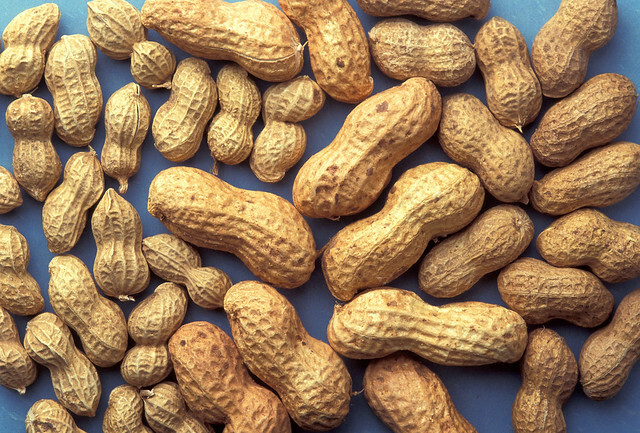 Strict avoidance of peanuts is the primary strategy to prevent anaphylaxis, but total avoidance is not always possible. That’s because many food products may contain food allergens in small amounts due to cross-contamination according to Chung. Thousands of children visit hospital emergency rooms annually due to accidental ingestion of undeclared peanuts in foods. Allergy treatments being explored include introducing small doses of peanut proteins by mouth or through a patch on the skin. The goal is to desensitize peanut-allergic individuals and induce the immune system to tolerate peanuts. To help reduce the possible side effect or risk of anaphylaxis in children during such treatment, it is important to use a less allergenic peanut extract. Chung and his team at the ARS Southern Regional Research Center in New Orleans devised three simple methods to produce peanut and cashew extracts that contain less allergens. They used a chemical to separate major allergens from nut extracts and magnetic gel-like beads to bind and separate major allergens, and extracted a commercial peanut flour under a non-acidic condition. This research, published in Food Science and Nutrition in 2017, could benefit people with peanut allergies who may be able to tolerate a less allergenic peanut extract during immunotherapy. How attainable are the peanuts and could an everyday person afford this high treatment. @Rowan Sharma - The study was preliminary and the validity of the methods used to develop the peanut extract needs to be confirmed in further research (e.g., clinical studies). Whether the treatment is affordable will depend on its effectiveness and how widely it’s used.